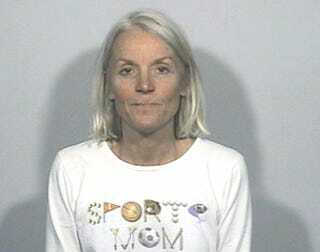 Carolee Bildsten allegedly ate at a restaurant without paying. When a cop visited her apartment, she reached inside a drawer as if she were getting cash but pulled out a "clear rigid feminine pleasure device" and threatened him. Note T-shirt.